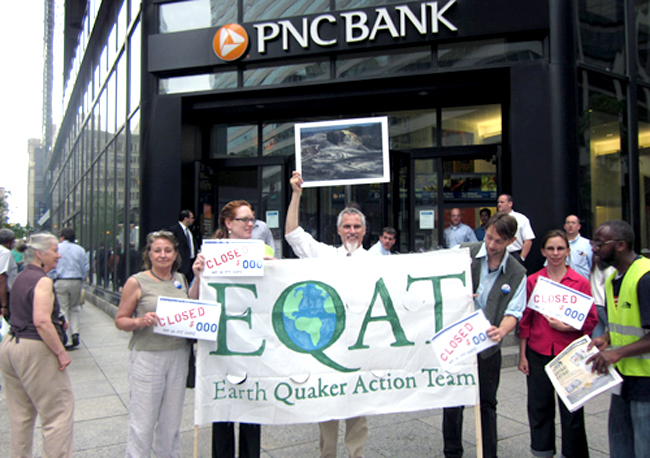 Bowing to pressure from Quaker environmentalists, PNC Bank announced yesterday that it will be restricting financing of mountaintop removal coal mining in Appalachia. The shift outlined in its 2015 Corporate Responsibility Report means PNC Bank will effectively cease its investment in this controversial practice. In 2012, PNC Bank financed Alpha Natural Resources, Arch Coal, CONSOL Energy and Patriot Coal, which together were responsible for nearly half (44.97 percent) of Appalachian mountaintop removal production. PNC’s total investment was $687.5 million for that year. Mountaintop removal has long been criticized for its negative environmental and health impacts. This process of getting coal from a mountain involves blowing up the top of the mountain and dumping the remains into rivers and valleys. The contaminants from the dynamite hang in the air and the sludge and residue from this process poisons water. Scientists note the impact of burning dirty coal is speeding up global climate change. PNC follows in the footsteps of other banks pressured to adopt policies cutting ties with firms specializing in mountaintop removal: JPMorgan Chase, Wells Fargo, RBS, BNP Paribas and UBS. This article proves that a small organization can make a difference. Personally, I believe it has to do with future liability cost in the USA as more and more citizens realize that their water and land is toxic without much hope to obtaining clean drinking water for generations..